Take a look around at any horse trial and the vest you see the most in the US, by far, is the Tipperary Eventer. Sadly this is also no where near one of the safest vests on the market. Even the newer ones only meet ASTM and SEI requirements, not BETA, and the old ones only met BETA 7 standards – which hasn’t been relevant since the 90’s. They’re pretty lightweight and comfortable, but basically any vest with gaps between the foam or on the sides is not going to be very highly rated for safety, especially for cross country. There’s just not enough coverage and padding. I wear a Tipperary and mine is pretty old… I’ve been seriously considering an upgrade lately and think it’s definitely well past time. As I’ve researched more and paid more attention to safety ratings, I’ve really come to like BETA’s system. BETA’s safety standards have three levels – 1 through 3. Level 1 (black label) provides the lowest level of protection that is only considered appropriate for licensed jockeys while racing. 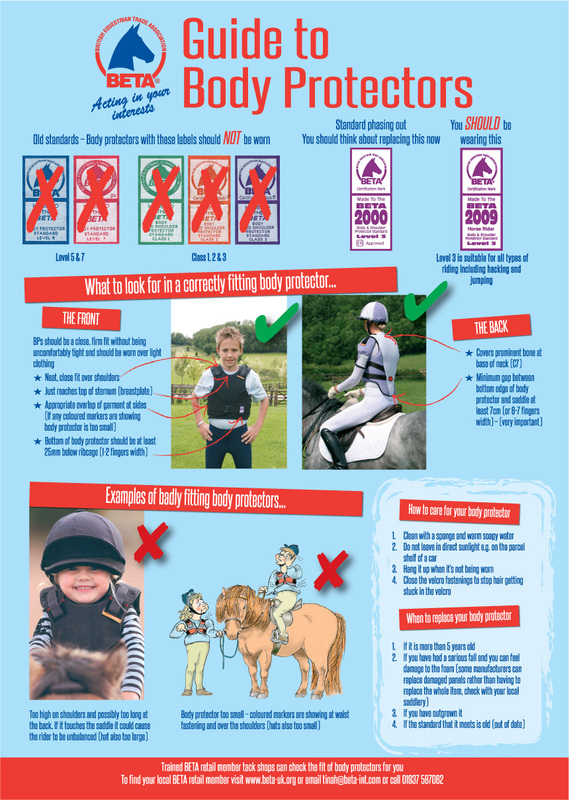 Level 2 (brown label) offers a lower than normal level of protection so is considered suitable for low risk situations – not including jumping, riding on the roads, riding young or excitable horses or riding while inexperienced. Level 3 (purple label) is considered appropriate for general riding, competitions including eventing and working with horses. Level 3 body protectors should prevent minor bruising that would have produced stiffness and pain, reduce soft tissue injuries and prevent a limited number of rib fractures. Most vests manufactured to BETA standards are clearly labeled with which level BETA rating they meet, which makes it very easy to shop for. From 1 January 2011, British Eventing has ruled that only BETA 2000 and 2009 Level 3 body protectors can be worn by competitors. 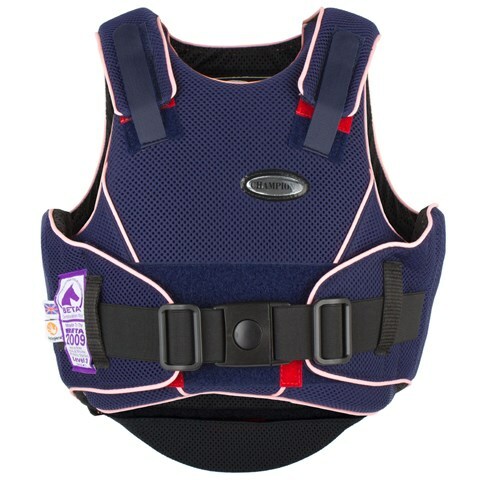 Cross Country and whenever else a body protector is worn. regular basis and to replace them if damaged. 2. PROTECTIVE VESTS. a. A body protecting vest must be worn warming-up for and in the cross-country EV EVENTING DIVISION © USEF 2015 16 test. Stable, team or club colors are permitted. The Federation recommends that the vest should pass or surpass the current ASTM standard F1937 or be certified by the Safety Equipment Institute. Inflatable vests are permitted only when worn over a body protecting vest. Wow is our rule ever as unspecific and lax as possible. We “recommend” that it pass some kind of standard… a standard that is much lower than the BETA standard. Kind of surprising considering how much of an issue safety in eventing has been over the past several years. Why are we so far behind? I think if you took away all of the old, non-BETA level 3 vests from Americans, almost no one would have a vest left. Including me. So I’ve been looking around at replacements, although granted haven’t made up my mind yet. Price is definitely a factor and navy is preferred, so that narrows my field a bit. Perhaps the Harry Hall Zeus? There are actually a lot of options if I buy from the UK. And pretty affordable options at that, much more so than if I purchased one of the few BETA level 3 vests available here. We shall see… it’ll be another month or two before I can afford an upgrade. What kind of vest is everyone else wearing, and why? I wear a Tipp, soley because of the heat factor. But after reading the findings about Jordan McDonald that were released yesterday, I am in full agreement that the Tipp needs to go. I’m hoping that some of the newer vests (fan of the Airowear myself) while heavier, won’t induce heat stroke like my old one did! I’ll be curious which one you end up with and looking forward to your insights on them. Yeah, the BETA 3 ones are all definitely bulkier and hotter than a Tipp. That’s the trade off for more safety I suppose! I’ve been thinking about a new one for a couple months now (I’m pretty sure I should have a long and don’t) but reading all about the findings yesterday scared me. I think I’d rather be a little too hot while being safer. 3) I am super petite, and the Tipperary was truly the only vest that I felt “fit” me, and moved with me, correctly. Granted it has been a number of years since I bought my vest but at the time there really weren’t many options. It was either buy Tipperary, which albeit low safety ratings was hands down the most comfortable, or go with something that had higher safety ratings but made me feel totally constricted and blocky. All the other vests I tried on honestly made me so uncomfortable I doubted I’d be able to stay on my horse just because of the restrictions from the vest. While I totally agree that the Tipperary needs to be phased out, especially with all the controversy surrounding safety in eventing, I really hope that some of the newer models offer more flexibility and better sizing options. We all know that one size fits all doesn’t fly in the equestrian world, and our equipment should reflect that. Many of the newer vests that are rated Beta 3 have a ton of sizing options. Especially the slightly pricier ones like Airowear. There is also at least one company that will make a custom size. I will say that it is significantly more difficult to find a lot of BETA 3 rated vests in this country. The selection is very slim, and being able to try on several at once would likely be near impossible. Sadly, that is the way it’s going to be until we change our safety standards and/or make more effort to educate people on the differences. Without a doubt the Tipp is the lightest and the most comfortable (because it’s so flimsy in comparison), so as long as that’s considered an okay option, people are going to take it. i got my tipperary off ebay for a pretty good price… while also being fairly aware of what that might imply safety-wise. it’s tough transitioning to eventing bc i had to get soooo much new gear and it’s all pretty pricey. so any upgrade for me will have to wait awhile – probably until i’m competing at a higher level or doing recognized stuff. definitely let us know what you settle on tho and how you like it! The Harry Hall is only about $150 shipped from the UK. There’s a lot more options in all price ranges there. Of course, that would also mean you wouldn’t be able to try it on before buying. I don’t wear a vest (because I’m a huge wimp and won’t ever go XC ever), but the mention of preventing rib fractures makes me wonder if Jessica Phoenix was wearing a vest when she fell last weekend, and/or which type of vest it was. Suffering internal injuries, plus 3 broken ribs and a broken collarbone is pretty gnarly. Or, it could be that she was wearing a super safe vest and it was just the kind of fall that caused the injuries. Either way, this is a pretty interesting post. It looks like Jess wears a Tipperary under an air vest. Depending on the nature of her fall, the air vest may or may not have inflated. Oh, it’s also interesting to note that BETA”s research has indicated that wearing shoulder guards on a vest decreases collarbone injuries by 80%. I was there when Jessica fell. She was wearing a protective vest and an air vest. She fell on a suspended log over a significant drop in the woods and thrown against a huge tree. The vest probably saved her from being killed. I wear a BETA-3 certified Intec vest. Is it the prettiest, most flattering thing ever? Hell no, it’s ugly. But it fits me properly, it’s as safe as it gets, and it was affordable. I always imagine a sharp stick or something stabbing someone through the gaps in the Tipperary vests! Yeah, these are basically my feelings. I wear an old BETA standard-something CO that I inherited from our barn manager’s daughter because it fits me and not her! However, anything but the newest and most expensive Tipperary vests don’t fit me right (float up over my shoulders like an over-inflated life vest). So I’m happy with my CO even though it makes me hot and sweaty and look like a beached whale. Hawley Bennett looks pretty freaking fab in her new CO which is BETA 3 certified. Much spendier than a Harry Hall, though. However, she and I have a very similar body type (no, I did not obsessively stand next to her when she was at our barn for the clinic….) and so I think it will probably fit me too. I don’t currently have a vest, but when I did have one I wore a Charles Owen. I bought it used, so price was a factor, but I did like it. I liked that each side wrapped around the rib cage. I’m another Tipperary owner. I went with it since it was the most comfortable and most readily available. I event at the “baby” levels we’re talking no more than 2’3″. That being said, I’m always looking to make sure I’m being a safe as possible. I love the look of the Harry Hall, it looks pretty comfortable. Can’t complain about the price either, where did you find it? I don’t have a dog in this fight. I don’t event and am not planning to. That said. I have a friend who got into eventing and who is very familiar with the insurance industry. Per her information, helmets contribute to reducing accident injuries/health costs by almost 80%, while vest actually have a negligible effect. I do not know where the numbers came from and if they were across equestrian sport or eventing specific, as that would potentially make a difference. Absolutely vests have a negligible impact as far as insurance claims go, because head injuries are by far the most common injury that would actually send someone to the emergency room. A vest is going to prevent bruised and cracked ribs, possibly some internal bruising/bleeding, spinal injuries, etc. All of those types of injuries are significantly less common than head trauma, but that doesn’t mean preventing them is any less important. BETA has done a lot of research as far as materials/structure and how that effects impact, and how that in turn effects injury. We’ve done almost none of the same research here. i love a good infographic. thanks for doing this research for us! ride safely this weekend in your tipp! Agree 1000%. I hate the Tipperaries. I get that they’re comfortable, but so are baseball caps instead of helmets, and they do about the same amount of good. Another flaw in their design: they do not remove easily. You have to cut all those laces in order to get at someone, and that risks moving them about when they have a spinal injury. A properly designed vest can be detached in a variety of ways that do not interfere with the spine. I wear an Intec because I am cheap. I paid $100 for it. After a few minutes it warms up and molds to my body and I barely notice it. I like the look of the Harry Hall above, though. I’ll admit I was naive and my Tipperary (now 12? 13? years old) has been my only vest. After reading about Jordan McDonald yesterday though, it definitely made me pause. With the British doing so well in the eventing scene, clearly we could take advice from them in more ways than one. Thanks for sharing such an informative post, very thought provoking and has made me rethink my vest choice! Yep, it was super interesting too that they recommend replacement after 5 or so years due to the materials degrading. Everyone knows that about helmets, but I’d honestly never thought about it for vests. Mine is pretty old! Okay, so I’ve been XC schooling once, right? I’m an expert now, obvs. I knew I needed a vest but I didn’t want a Tipperary (even though I loved my Tipp helmet) because of the level of certification. I found a Level 3 on eBay in black and snatched it up (demo, $85). Horseloverz sells the one I have and here’s a link. Granted I’ve only worn the thing twice, I like it. Yes, it comes in navy. I wear the Airowear Outlyne. I chose it for its protection, primarily, especially for the shoulders. It’s comfortable and easy to wear. It also comes in a wide range of sizes, which is important for me: I’m both short and round, so the off-the-shelf standard sizes don’t always fit. I recommend the Outlyne to anyone! I also wear the Airpower Outline but without the shoulders. I actually don’t think it feels bulky at all (or at least not after the first time you put on. I’m not sure if it would actually save you from being injured if a horse fell straight on top of you but I definitely think it’s safer than the tips. Actually, that was the one thing I was surprised about at my last barn, they all wore tiperarys with air vests (which I am not sure really are the best thing for XC but that’s a different post). I was the only one who wore something substantial. When I thought I was getting back into eventing, I tried to replace my (antique) Tipperary. The problem was that no matter how much money I wanted to spend, I could not buy a Level 3 vest that would fit me properly. The ONLY custom vest I could get that came close to my measurements was a Tipperary, and then throw an air vest over that. All the Level 3 vests left my lower 2-3 ribs exposed, as well as my lower back and tailbone. If I got a vest long enough for my torso, it was 6 sizes too big in the body. Fortunately now all I have to worry about is who to get to tailor my dressage jackets. Maybe not the best way of dealing with the problem, lol! Some of them come in tall and tall/slim now! They’ve done great things in the UK lately. If you ever need another one maybe look into Airowear… they do custom. When I bought my mare a couple years ago–an un-restarted 6yo OTTB–I looked into vests. I was going to be starting her in a 40-acre field and mostly riding alone. So I did my homework and looked at my budget and sold my old Tipperary to buy an Intec Crusader. I actually like it just fine. And it’s navy, and it’s Beta-3. Never came off the mare, but glad I had it on while I broke her. I put it back on to break Mo, and now only when it’s required for competition or schooling, but it’s fine. I’ll keep it til it wears out or I come into more money (HAHA I will not spend money on a vest if I don’t need to and there are bridles to buy, let’s be real). I obviously don’t wear one, but I really like the USG you posted. It may help a little to know that Smartpak offers the Airowear, Rodney Powell and the CO Kontact – all of which I believe are BETA 3. When I do look for something, I plan on using that to my advantage – thank you free return shipping – and finding out my size then probably ordering from overseas. I’m the most intersted in the Airowear (which I believe Riding Warehouse also carries) so it works out well. Not sure if you can find the other 2 overseas cheaper. Yep they do! There’s a few available here, just not quite the selection. I wear the Airowear Outlyne. It’s Beta 3, pretty comfortable and was customizable. I needed a short backed one as the regular ones all hit the saddle. It’s also designed to fit women as opposed to being unisex, so it fits better than other ones I tried. I actually wear a vest EVERY time I ride, not just eventing/jumping. I broke my back in a fall about 2 years ago and I don’t ride without a vest anymore. It is hot though, so I’ve ordered a Hit Air vest to replace it for trail riding. I still wear my Tipperary vest that I got when I first started jumping in lessons. That must have been…2005?? Honestly, I’ve never really stopped to think about best safety the way I think of helmet safety. Thank you for this post! It was really informative and interesting and now I’m scared shitless that my Tipp isn’t going to do jack the next time I fall. Looks like I’m due for an upgrade too. Maybe we should start a campaign similar to #mindyourmelon? #protectyourchest? #saveyoursternum? Side note: during Rolex I noticed tons of Americans (all of them?) wearing air vests over BPs (a lot of Tipps) but many of the European riders going without an air vest and just having one of the “bulkier” vests (how I labeled them in my mind) – I really wondered why that was, but now I think maybe it’s because the vests they are using are all safer anyway! I think the Europeans are in general a little more leery of the lack of research behind the air vests. If I ever got into serious cross-country situations I’d definitely upgrade. But… For now… I have a Tipperary for my rare hunter paces… I could afford it. Thank you for this post! I’ve never understood why so many people wear the Tipperarys on cross country given that they basically offer no protection. I ride over some pretty hard-core trails at speed for my sport. Most people wouldn’t attempt the kind of trails I do even at a walk. So I decided to go with a Beta Level 3 vest: I have a Lami-Cell that I got from Valleyvet: https://www.valleyvet.com/ct_detail.html?pgguid=14bdc78a-68cb-41aa-9ea2-50cc1673b170&gas=safety%20vest both because of the safety rating and the cost: all of $108. I’ve had it for almost 2 years now and am thrilled with it. Yes, it is hot, and yes, I have a really hard time wearing it in the summer when temps are in the 80s+ with humidity, though that’s not a huge problem because there aren’t that many endurance competitions in my region during the hottest summer months. It’s not pretty and it’s a plain black but I love that vest and it has already saved me more than once. It molds to my body after wearing it for a while and the Velcro adjustments on the shoulders and sides means I can adjust it to fit my short torso perfectly. I’m probably a bit late to the party, but what about the Dainese Balios protector? Dainese is the like the gold standard for motorcycling protection according to all my moto friends and they pointed me to Dainese stuff. They have equestrian section now and their stuff looks pretty good. I would think a moto company would be able to produce some good protective gear that is flexible and comfortable to wear. I’ve been eyeballing their breeches, but haven’t bought them yet. They also have some specific breeches that have some padding over the hips and your tailbone in case you take a fall. Seems pretty reasonable to me…also their protector looks pretty slim fit and easy to wear. Well…the Dainese is a bit more expensive than the vests you’re looking at, but worth a gander? I got it from a guy who sells point two and I think this is the vest that point two paired up with for their combo air/safety vest? It fits me well and has some adjustabilty to it. I’ve found that with most of the bulker vests they need to “warmup” and once you’re in them for 10-15 minutes they start to mold to your body shape. It is a bit more than my old Tipperary but I still feel like I can move in it. I had no idea about BETA ratings until that EN article. I have an old Tipperary that I plan on dumping as soon as I can get a BETA Level 3 vest. Thank you for this post with all the vests, and I’m glad so many others have chimed in, to help me shop and compare!